While the Europa League is the undercard of European football, this match was talked about as a potential "showstealer" given the way Athletic have played this season, and because, well... it's Manchester United. After being regarded as the most "English" side in the Spanish top division, there has been a complete change in the team's philosophy under new coach, Marcelo Bielsa. The Chilean has been nicknamed "El Loco", and for good reason. I could do a post solely on hilarious anecdotes about the man. He is totally bonkers, but can also be brilliant, and after struggling to impart his ideas on the team early on, they have matured into one of Spain's most impressive sides, currently 5th in the league, making the Copa Del Rey final, and with a decent chance of qualifying for the Champions League next season. His players joke about Bielsa's obsessive nature, but acknowledge that his unique coaching alchemy is bringing the best out of them. Javi Martinez is one of the finest "holding midfielders" in the game, while their front three of Fernando Llorente, Markel Susaeta and the electric Iker Munian are arguably the most exciting attacking trident in Spain, which says a lot when you look the respective attacks of Barcelona and Real Madrid. While it's the way the game is going, it saddens me a little that those four players will probably be plying their trades elsewhere in the next couple of seasons. Despite what I've said, Bilbao don't identify themselves as Spanish, but as "Basque". Like Barcelona, their provincial, anti-establishment outlook means that their football team is a cultural signpost rather than just a sporting organisation. But unlike the Catalan giants, Athletic only employ players who are from the Basque region of Spain, which makes their ability to compete at the top level of the game all the more remarkable. We should also give a mention to their passionate support. While Old Trafford can be a place where most of the crowd noise comes from the away end, there can't have been many more raucous travelling supporters in Old Trafford than the Athletic fans. They roared, they cajoled. they entreated, and their players responded in kind. Athletic are a side that replicate many of Bielsa's teams of the past. Anyone who saw his Argentina team or Chile team in the 2002 and 2010 World Cups will recognise this; rapid passing allied with fluid movement off the ball, intense pressing from the front when the opponents are in possession, attacking and defending as a collective. This is all underpinned by high energy and an indefatigable spirit. Watching this Bilbao team - and most Bielsa sides - is reminiscent of how a basketball team operates. From the opening minute, United were hit by this Basque wave, with Llorente almost giving them in lead in the 3rd minute. However, much like in their victory over Tottenham on Sunday, United managed to hold out, and hit Bilbao with a sucker punch down the other end, Wayne Rooney giving the English champions the lead. If you thought that would knock the Spaniards out of their stride, not a bit of it. Athletic continued to play their sharp, one-touch passing, and were much the better side throughout the first-half, with a late Llorente header bringing a deserved equaliser before half-time. And if you thought that the half-time interval would bring a strong riposte from United, once again, not a bit of it. Bilbao were making themselves thoroughly at home, and were only prevented (initially) from scoring a second by an inspired display from David De Gea in the United goal. Athletic were the unwanted house guest that the hosts were unable to get to leave. But while Sir Alex Ferguson and the United fans were being driven to distraction, it was a joy for all neutrals to behold. Bilbao play football with the handbreak off, and when it works, it's a glorious sight. And there was no sight more glorious than Bilbao's second goal. Volleyed home by Oscar De Marcos after a sumptuous passing exchange, only the most one-eyed United fan could fail to deny the sheer beauty in the goal's conception and execution. While De Marcos was narrowly offside, journalist Phillippe Auclair tweeted that De Marcos was "morally onside". Watch the goal and you'll see exactly what Auclair means. And Bilbao weren't done there. They were in complete control of the game, making the ball their master. Their fans begun to "ole" every successful pass, of which there were many. It was borderline exhibition stuff. United could barely get near the ball. I haven't seen a team make them look so subservient at Old Trafford since Arsenal played them off the park back in 2002. Not even Manchester City's 6-1 win earlier this season was this commanding. A 2-1 win to take back to Spain would have been more than enough. But they found a third after capitalising on some soporific defending from United. The superb Munain tapped home a rebound after De Gea (far and away United's best player) made another fine stop from a Gaizka Toquero effort. In the commentary box, Dave Woods exclaimed, "Old Trafford used to be a European fortress, now it's a gift shop!" Bilbao were in dreamland, but were brought back to reality as Rooney scored a late penalty after a reckless handball from De Marcos. However, a 3-2 win is still a remarkable result, only surpassed by an engrossingly swashbuckling performance. This was an exceptional display of football, full of coruscating verve, which reminds us why we love the game so much. And now United have to travel to the Basque cauldron that is the San Mames Stadium next week. 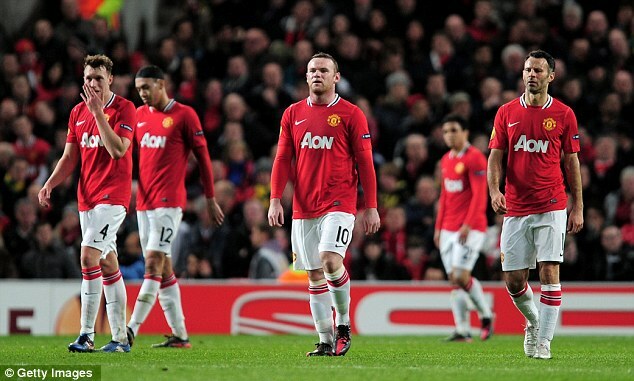 It will take an exhibition of similarly wondrous football from United if they're to overturn the deficit they now face. But regardless of what happens next week, we should revel in one of the finest performances we'll see all season. Along with Leo Messi's bravura five-goal display against Bayer Leverkusen last night, Athletic Bilbao and Marcelo Bielsa have put us back in touch with why football is the world's most popular sport. So on behalf of all (true) football fans everywhere. Thank you Athletic. Thank you El Loco.